Sarai and Yael got their report cards from school this morning and are now officially free from school till September 1! Michal has her end-of-year party tomorrow at the Nautical college, with a ceremony and throwing of the hats in the air etc, as she is graduating too! How fast the time went! Her army call is scheduled for February 7th, so she"ll have to find a job till than. Hopefully get some photos to show you tomorrow! A dinnerservice and a tea service in their original boxes. 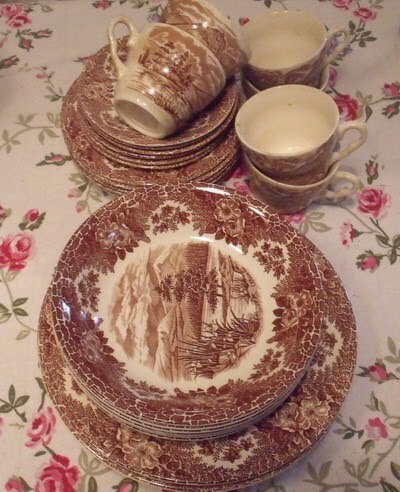 It is English Ironstone Tableware LTD Staffordshire transferware with the lake district pattern. Never used, totally new in box. 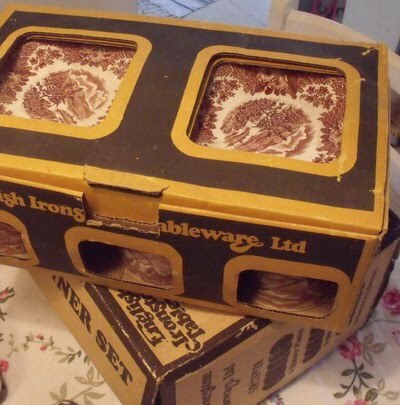 The seller said it had been stored for decades. Cost for both boxes together 193 shekels (52 dollars). 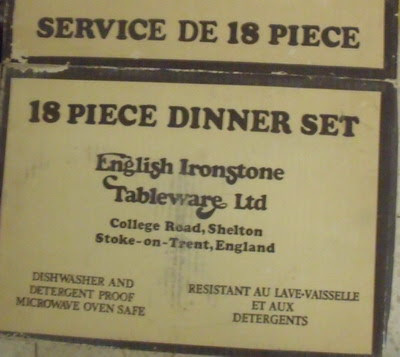 I wanted a full transferware set for a long time and they are so very hard to find here! 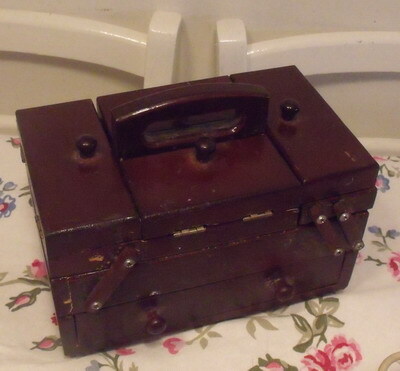 A wooden vintage needlework box for 20 shekels (5 dollars). 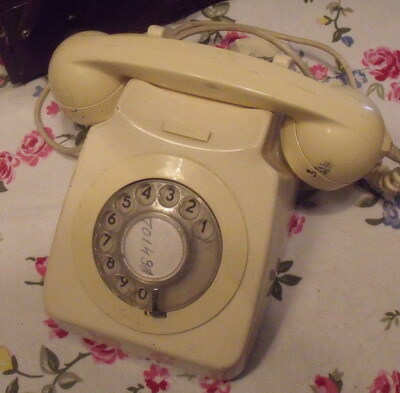 A working vintage telephone in ivory white for 40 shekels (around 10 dollars). It needs an adapter and a good clean, but it works. 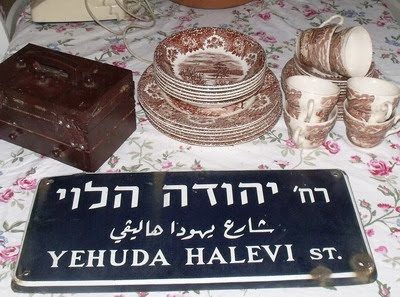 and a vintage enamel streetsign from Yehuda halevi street (there is one in Tel Aviv and one in Haifa - as this one has the name in Arab too my guess is, it's from Haifa)! He wanted 150 shekels, but I got it down to a 100! (27 dollars). As I walked to another antique store at the fleamarket, an antique store owner wanted to buy it from me, asked what I had paid and offered me on the spot 150 shekels for it. hehehe. Took it home of course as they are very rare and I love it. I saw a similar sign on Ebay for 295 dollars. From: Avraham Sosḳin. Photographs of Tel Aviv. 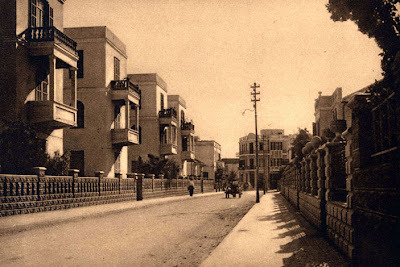 Berlin, c. 1926. You certainly did well with your flea market buys. Well done for finding them. Many thanks for your lovely comment on my giveaway post and for being so kind to put it on your sidebar. Mazel Tov on Michal's graduation and with high honors! Also, congratulations to Sarai and Yael on their completion of another school year. Hope everyone has a fabulous summer! Lovely pictures and journaling of your flea market finds! You did very well!! !